Melanie Benard was recently interviewed on CKUT’s show The Avalanche. This is a radio show by and for people with disabilities. You can listen to the interview here. 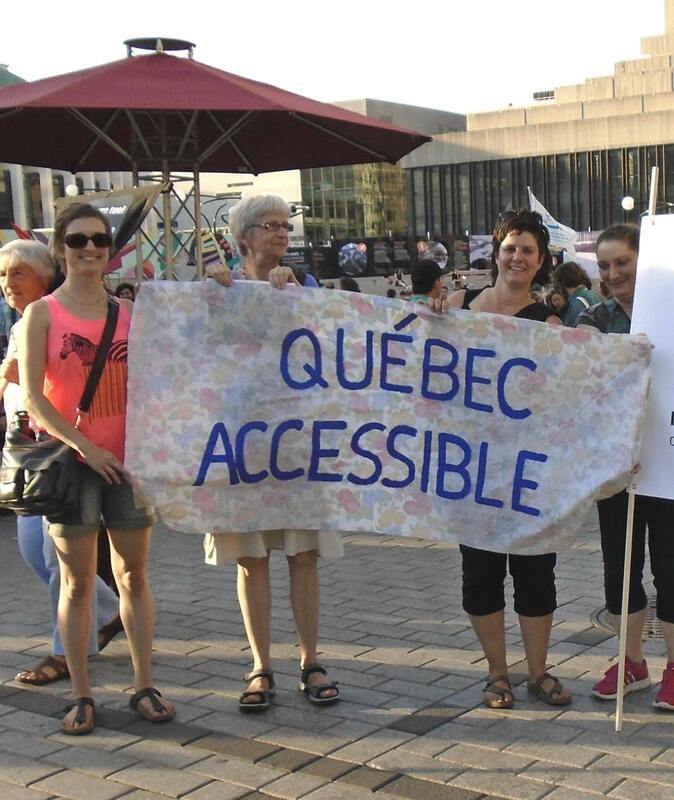 Two years ago, Quebec Accessible contributed to the World Social Forum (WSF). The WSF is the largest gathering of civil society organizations aimed at finding solutions to the problems of our time. Every year, it brings tens of thousands of participants together for more than a thousand activities (workshops, conferences, etc.) on various themes. Two of Quebec Accessible’s co-founders (Marie-Eve Veilleux and Pierre Lemay) co-facilitated the FSM’s Disability, Deaf Culture and Barrier-Free Society Committee in 2016. This committee encouraged the development of activities on issues that affect people with disabilities and Deaf people. Quebec Accessible co-organised a few events at the FSM, including the Grand Conference on ableism and audism. Videos of the three speakers (Laurence Parent, Lawrence Carter-Long and Pamela E Witcher) are available online with captions and interpretation in ASL and LSQ. With the provincial elections fast approaching, this is a great time to get familiar with the concepts of ableism and audism. Let’s question our elected officials and political candidates about their commitments to ensure real inclusion of people with disabilities! Stay tuned for more information about our upcoming campaign for the provincial elections. Did you know that Quebec was one of the first provinces in Canada to adopt a law promoting the inclusion of people with disabilities? In 1978, Quebec adopted the Act to secure handicapped persons in the exercise of their rights. This law was modified in 2004. Quebec’s disability law lacks teeth. Unlike laws in other provinces and countries, it only applies to the public sector (ministries, government agencies and municipalities), and it has no clear goals or penalties to ensure compliance. 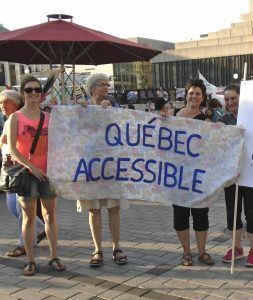 That’s why Quebec Accessible is calling for a stronger provincial law to promote accessibility and inclusion for people with disabilities. We have developed new tools to help you understand the content and gaps in Quebec’s law. Click here to learn more about the law, the limited results achieved so for, and our recommendations for improving the law. Please share these resources with your networks. Information about accessibility laws in other provinces will soon be available on our website. Stay tuned for news about our upcoming campaign for the provincial elections this fall. We just published our first newsletter! It includes an introduction to our group, a list of articles and news segments about an accessibility law that were published during Quebec’s Disability Week, and six opinion pieces. Click here to read it in HTML format. Don’t forget to subscribe to our mailing list to receive our newsletters and invitations to our events!